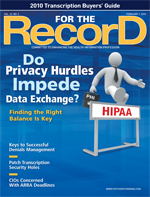 For The Record: Do Privacy Hurdles Impede Data Exchange? Do Privacy Hurdles Impede Data Exchange? The industry searches for middle ground in the debate over how to exchange protected health information without violating patients’ privacy rights. The passage of the American Recovery and Reinvestment Act (ARRA) brought with it a bevy of new regulations governing the protection and use of protected health information (PHI) designed to strengthen HIPAA and sharpen the teeth of state-level privacy laws. It also added fuel to an already heated debate that pits some privacy advocates against those who champion the unfettered exchange of deidentified PHI to improve healthcare access, quality, and safety, as well as to advance medical research. Central to this debate are questions regarding a patient’s right to privacy vs. the industry’s need to advance technologically and scientifically. Specifically, are privacy laws that restrict the sharing of PHI preventing effective data exchange and impeding the scientific research necessary to advance the practice of medicine? While those advocating for stronger privacy protections and those politicking for greater PHI exchange appear to be diametrically opposed, the reality is that the debate is made up of many shades of gray and the two sides are actually in agreement on many points. Most agree that the ability to exchange data is beneficial to patients. They also agree that an effective consent system is needed that enables patients to control when, with whom, and for what purposes their PHI is shared. The fissures don’t truly erupt until the conversation turns to the breadth of those consents and whether exceptions should be made for the use of deidentified data for research. Those involved in the debate are also often at odds over whether there really is such a thing as deidentified PHI and, if there is, whether it can maintain any scientific value once it is stripped down to a truly anonymous form. Most agree that a properly structured patient consent process could go a long way toward resolving the privacy vs. advancement debate. However, it would need to go beyond even the latest consent regulations contained within ARRA that allow patients to restrict the disclosure of PHI related to treatments or other services paid out of pocket. To be effective, the consent process would also need to overcome variances between the patchwork of state laws that currently govern privacy of PHI. Doing so would eliminate the argument made by many healthcare organizations that it is impossible for their systems to electronically manage the varying restrictions placed on PHI. The challenge for both sides is to come up with practical solutions that allow patients to decide for themselves whether the benefits of releasing their information outweigh the risks and that it can be accomplished in a way that is technologically feasible. Starting with the assumption that some type of consent will be obtained is a start, although some problems, such as minor consent, defy simple resolution. For example, Belfort notes the New York consortium is temporarily excluding the exchange of any information related to minors between the ages of 10 and 18. This allows them to circumvent a complex, multifaceted issue that could drag down the entire process. “It is one way to address the privacy issue and still have a robust exchange of information,” he notes. Detmer suggests an effective consent process could be as simple as giving individuals the chance to opt in or out of data sharing, at least at the state level. As proof that such a basic system would be effective, he points to statistics from Utah, where just 3% to 5% of parents opt out of exchanging childhood vaccination histories, and Massachusetts, where 95% to 97% of the population agreed to join the state’s data exchange system. Peel argues the issue surrounding consent is not that a suitable process doesn’t exist for granting informed electronic consent. Rather, the problem is the illegal use of PHI by secondary parties to whom no consent has been granted. She uses the pharmaceutical industry as an example. When an individual drops off a prescription at a local pharmacy, even if they pay out of pocket for the medication, their information is automatically available to multiple secondary organizations, including pharmaceutical data-mining companies and manufacturers. Such unauthorized, yet largely uncontrollable release of PHI can have a chilling effect on individuals who fear that seeking care may open them up to discrimination by potential employers and insurance companies. In fact, Health and Human Services estimates that nearly 600,000 Americans did not seek early treatment for cancer and 2 million did not seek care for mental illness because of privacy concerns. Also, the RAND Corporation found that 150,000 U.S. soldiers suffering from posttraumatic stress disorder did not seek help because of privacy concerns. The other hot button issue arises when the debate turns to the use of PHI for research. Again, the issue is far from black and white, with both sides acknowledging there is great medical and societal value to be derived from the sharing of data among researchers. Where they disagree is the issue of whether consent should be secured before data are shared, even when they are deidentified. According to Detmer, the problem for researchers is that despite the HIPAA exception, U.S. policy does not distinguish between the use of PHI for medical care and its use for research. Therefore, individual patients have no real means for specifying that utilizing their PHI for research is acceptable, especially if they have concerns about that same data being shared elsewhere. For privacy advocates, the real problem with regulations allowing the use of deidentified data is that there is no way to prevent that data from being reidentified. Plus, there are no penalties if data are reidentified. “Those claiming to deidentify data should have the burden of proof. They should release their methods for deidentification so outside scientific experts can verify whether the claim is accurate,” says Peel. That is why some advocates for expanding access to PHI for research purposes say it’s time to stop pretending that it’s possible to fully deidentify data and that such data would be useful for researchers. Instead, they say the best approach is to give individuals the opportunity to opt out of allowing their full data to be used for research. According to Jamie Heywood, chair and cofounder of PatientsLikeMe, the societal value of allowing researchers to access open data far outweighs the risk to the individual. Eliminating the fallacy of deidentification would allow individuals to make educated decisions regarding the potential value their PHI holds for advancing medicine. Heywood, whose Web site is a community where individuals diagnosed with life-changing diseases can post information and share experiences, likens the current regulatory environment to neighboring cities that are legally prohibited from sharing information on crime. He also makes the case that people are more than happy to openly exchange health information if it will be used to help others and themselves. Heywood points to the more than 40,000 members of PatientsLikeMe who encompass nine disease communities to illustrate the willingness people have to be open about some of the most sensitive medical issues. There’s one sector rarely heard from in the debate surrounding privacy laws and the advancement of medicine: the general public. Do patients want the opportunity to consent to having their protected health information (PHI) used for research? Do they care whether their information is shared among providers? Though there has been little fanfare over the findings, there have been several studies on the issue. Most recently, the Agency for Healthcare Research and Quality held 20 HIT focus groups across the country. What it found was that the population, though conflicted, had some pretty clear views on who should decide what happens to their data. In addition to concerns about hackers, participants also expressed fears that their data could be shared with people who wanted to use it for purposes other than the provision of care. Finally, participants supported the idea that healthcare consumers should be asked for their consent before their medical data are stored electronically and that they should be able to elect to leave their data in paper format.